A quick photo and safely back into the water goes Tony’s catch of the day. Guide Cassandra is an expert in multi-tasking and smiling with panache and style. 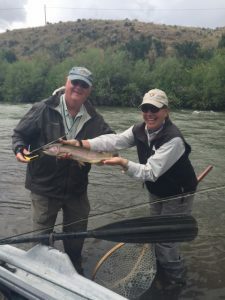 Tony was a huge part of our Project Healing Waters Fly Fishing, Inc. week. Thank you for your help and support Tony!